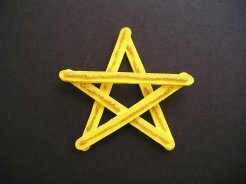 This Popsicle Stick Star is a great kids craft. Just make it as an everyday star, or tie some yarn or ribbon through it and make it a Christmas Ornament! 1. Glue two sticks together like a tee pee, as shown in the picture. 2. Glue 2 more sticks crossing each other, as shown in the picture. 3. Join the last two points by gluing a stick across. 4. Once the glue is dry, paint your star and add glitter glue and/or other embellishments!